While discussion of Israeli elections has largely (and reasonably) focused on the different parties’ views on the occupation of Palestine and the prospect of war with Iran, the ongoing effort to craft a coalition government may carry risks for science education, too. Ha’aretz asked the leaders of the eleven parties competing for seats in the election a series of questions, including questions about evolution and climate change. On climate change, all seven who responded spoke in support of action. Unfortunately, the remaining four parties declined to answer, and all four are likely to be part of the governing coalition. Those pro-evolution parties took 42 seats, with the creationist parties who answered garnering 28 votes, and an additional 50 votes distributed among the conservative parties that declined to answer. The prospect of battles over evolution in Israel is likelier than one might expect. It was only last year that Israel mandated the addition of evolution to the nation’s secular middle school curriculum (and it remains out of the curriculum for state religious schools). Five years ago, the education ministry’s chief scientist spoke against evolution, leading to his rapid ouster. While the Israeli public is not as anti-evolution as the US, 43% told the International Social Study Programme in 2000 that it is “definitely” or “probably not true” that humans evolved from earlier species of animals. 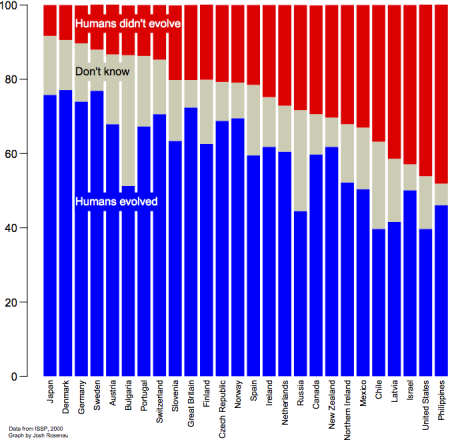 In the same survey, 46% of the US respondents were similarly anti-evolution, with only the Philippines (48%) showing higher rates of evolution rejection.